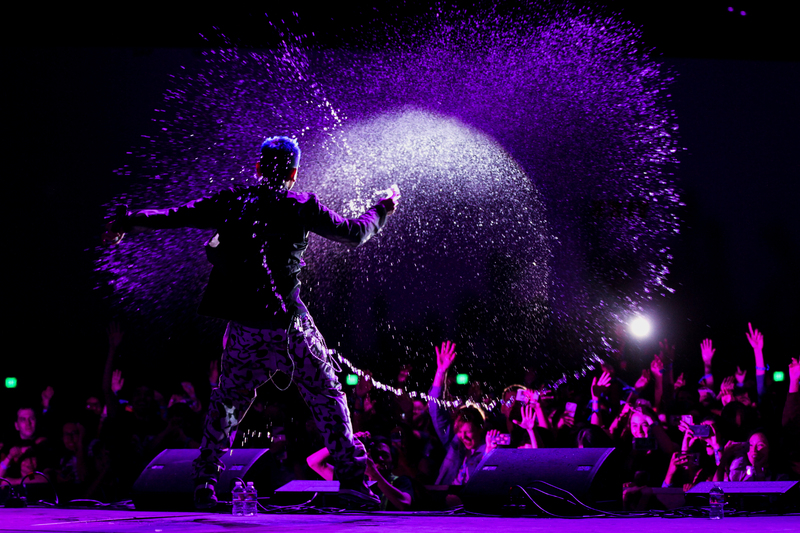 Let's explore your first KCON Convention Adventure! Welcome, new and returning KCON-ers! Each year, we have tons of fun programs for you to enjoy! 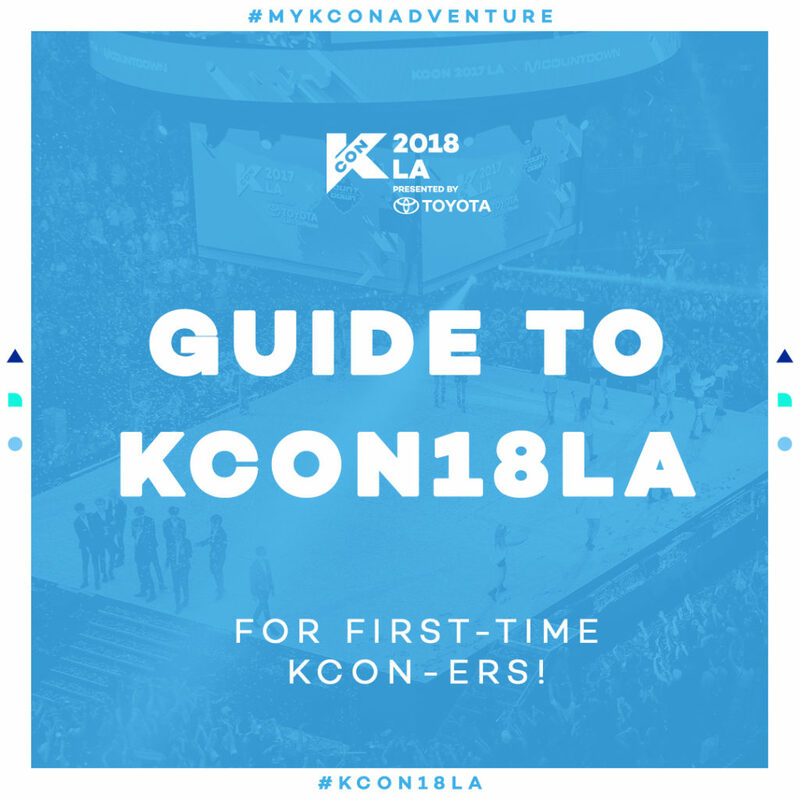 We know that in the midst of all the fun, it can get a bit confusing what certain terms mean and how to make sense of the schedule so we’ve made a KCON 101 : Guide to KCON18LA to help you maneuver your first KCON experience! 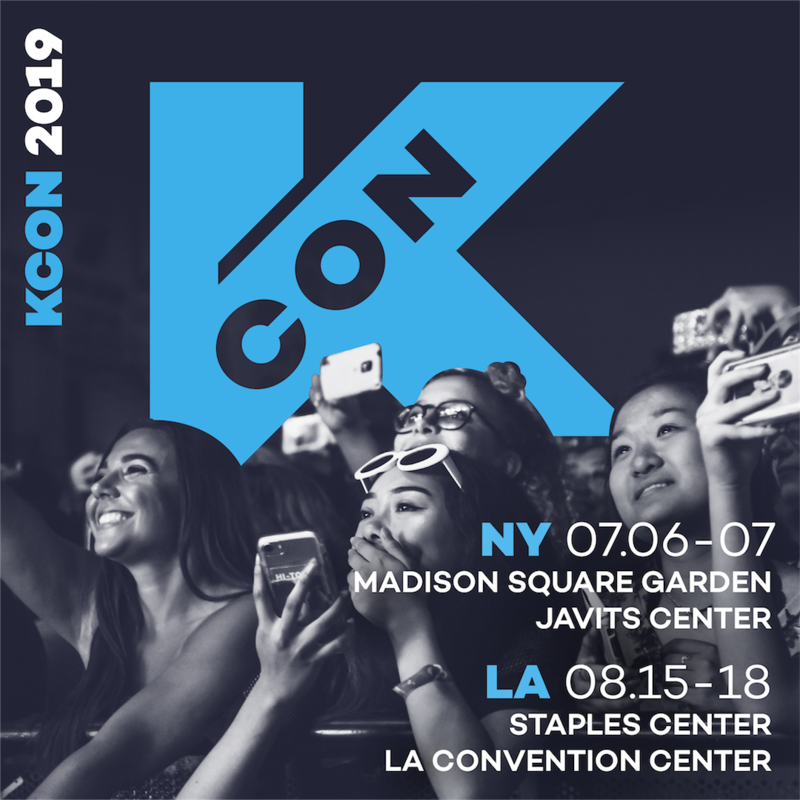 The events and programs we will be recommending below are available at our KCON convention, which means you’re going to need a Convention wristband. If you haven’t gotten one yet, please register for the KCON Convention here. (1) 3-day pass is $30. There are no single passes available this year, but we’ll show you why the convention will be worth it! The programs we will be recommending in this itinerary can only be accessed at our KCON Convention, which means you will need to register a Convention wristband. If you have one already, you’re ahead of the game! You can go on ahead like the girls of fromis_9 to the Check-In information. If you don’t have a wristband yet, don’t worry! You can still purchase and register a 3-day wristband for $30 (before fees) on here today or on-site during KCON LA. We have to warn you, on-site registration and check-in will take some time, so we highly recommend you and your family register your wristband online. View the full Convention Schedule. Now that you have your wristband, you’re ready for check-in! Make sure you have your registration confirmation, ID, and all other requirement documents. 9 AM – 5:00 PM on Sunday, August 12th. However, we highly encourage you to do early check-in on August 9th so you can have more time to explore the Convention. If you or any of your family or friends have purchased artist engagement vouchers, you will definitely want to check-in on August 9th or the morning of August 10th before the Convention starts so you don’t accidentally miss any of your artist engagements! 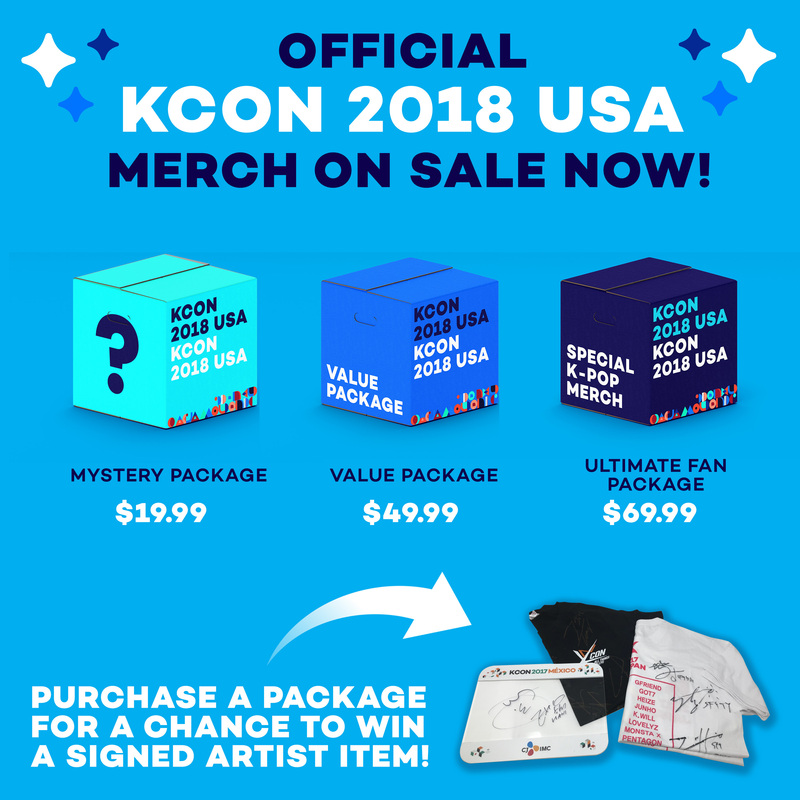 You can purchase your water bottle and other KCON merchandise until August 2nd on Mwave or onsite at KCON 2018 LA. Onsite, there will be schedule changes, surprise artist booth appearances, and important reminders. 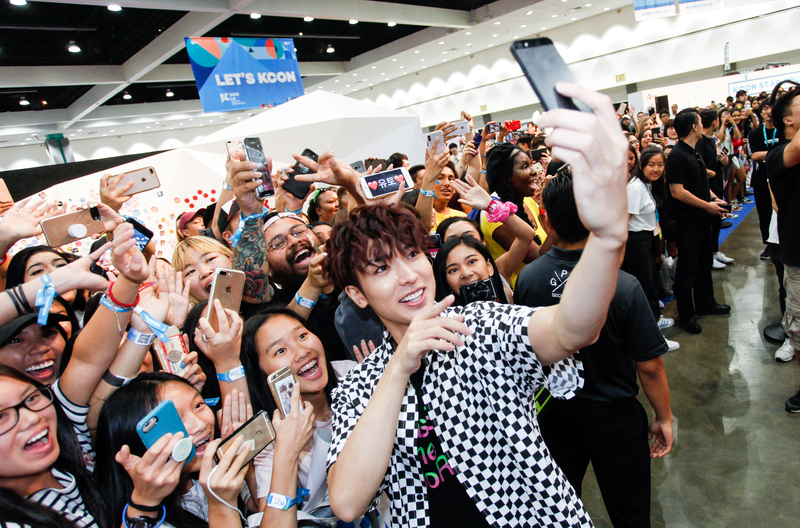 Please make sure to download the KCONUSA app (iOs | Android), and follow us on social media (Instagram | Twitter | Facebook) for realtime updates. It’s well-worth the minor annoyance of push notifications so that you don’t miss your favorite artist appearing by surprise at the convention. 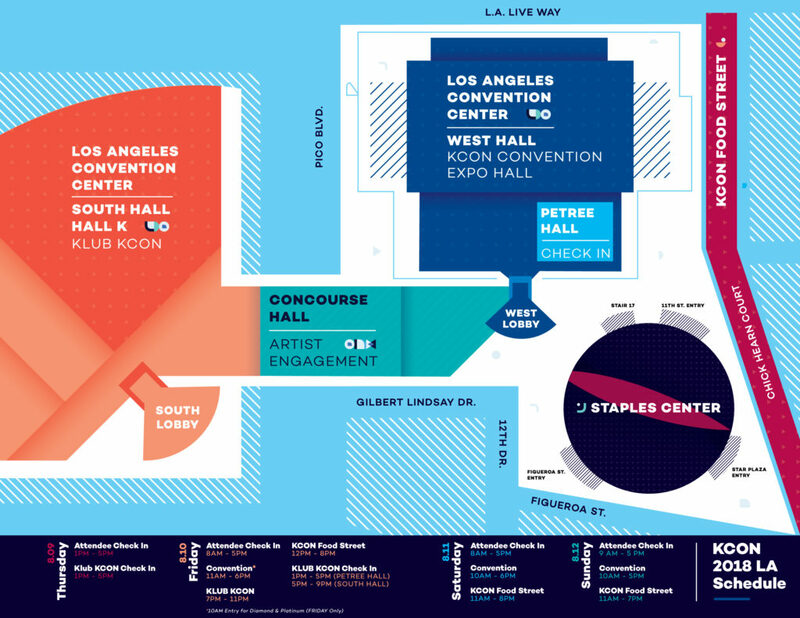 The LA Convention Center is huge and with so many different programs happening every hour, you might want to check out our map of the convention center to better navigate your way around later. Hopefully, as you flip through all of the recommended programs below, you’ll be able to orient yourself even before the event starts! Petree Hall: Here you’ll be able to register a convention ticket, check-in, and retrieve items you might lost. 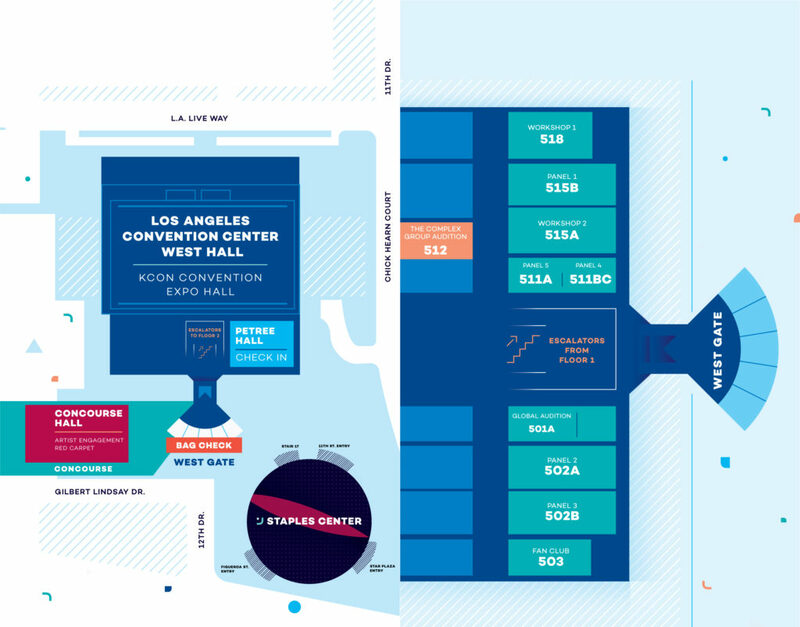 West Hall: This is the area where you can experience all of our convention panels and workshops. If there’s a panel you’re really excited about, get a seat early. Concourse Hall: In this zone, you can find our market, sponsors, picnic area, and our stage. A lot of sponsors and vendors have great things to see, purchase, and/or giveaway, so it’s good spot to peruse before it gets busy! 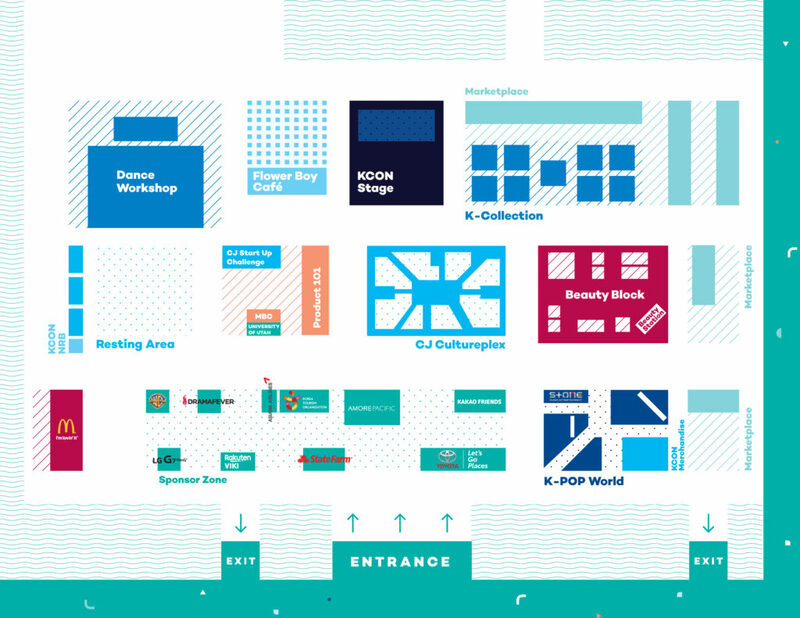 Plus, our official KCON Merchandise Booth is here. Get your merch before it’s sold out! Have you ever wanted to meet your favorite K-Pop idol up close & personal? Now is your chance! If you have purchased an artist engagement package here, you may have the opportunity to “hi-touch,” or hi-five, the artist listed on your hi-touch pass! If you don’t win a hi-touch pass but instead have an audience pass, don’t worry! You’ll be able to watch your favorite idols have some fun on stage and answer questions you’ve sent them during our Twitter event. Artist engagements are once-in-a-lifetime experiences, so you won’t want to miss out! You can only add one artist engagement pack per convention ticket purchased. KLUB KCON is a big K-POP dance party that takes place from 7:00 PM to 11:00 PM on DAY 1 and is open to KCON-ers of all ages (if you’re under 13 yrs of age, you must bring a guardian). 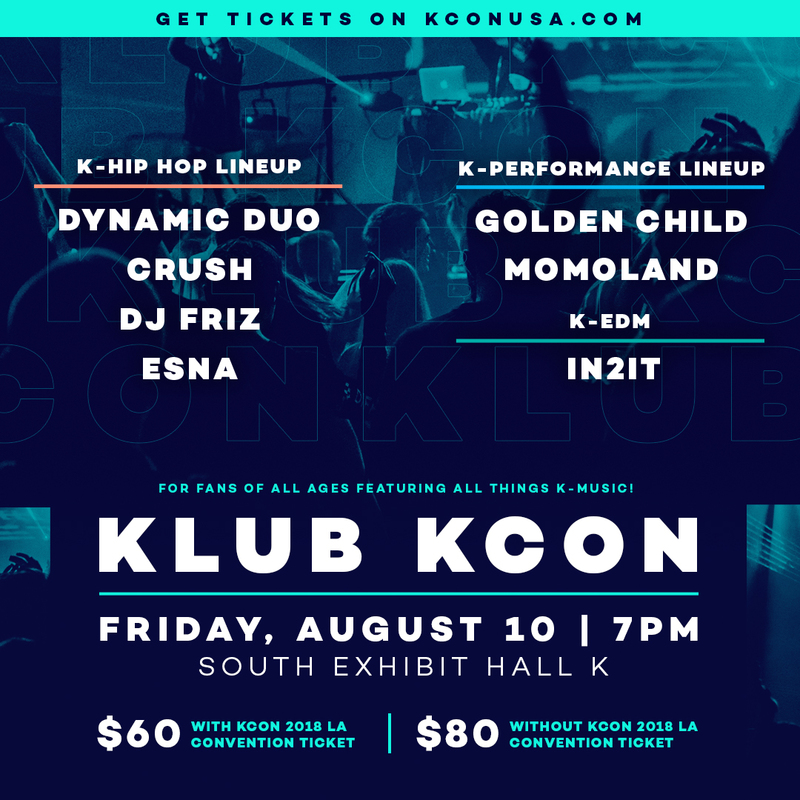 KLUB KCON is a Convention ticket add-on, and you can register for it along with the Convention here. If you weren’t able to purchase an artist engagement pass, you might still be able to meet some of your favorite groups through our “new” program STAR Live Talk. 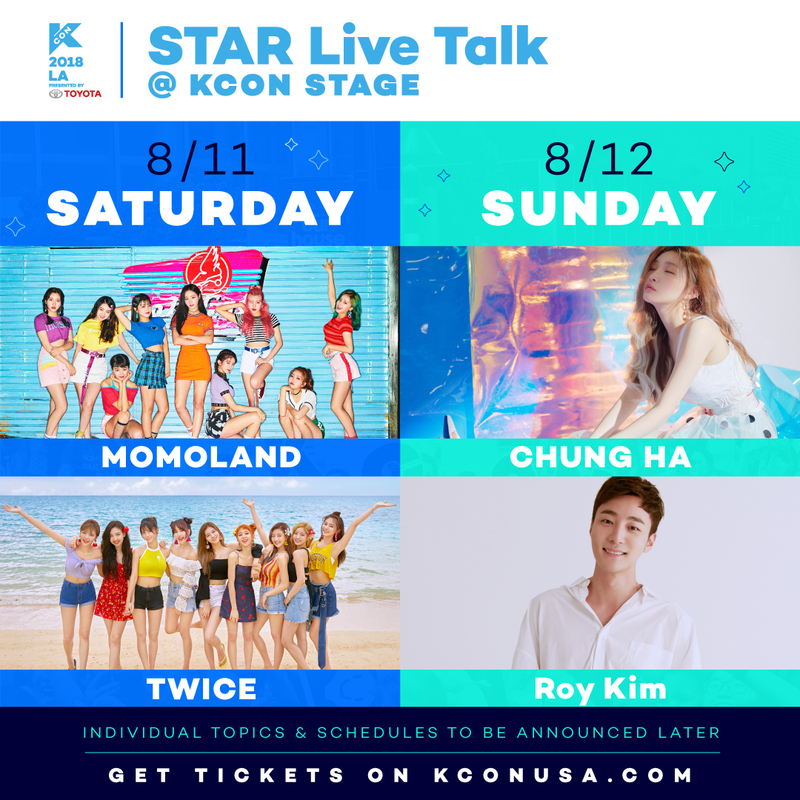 Some artists from our KCON18LA lineup will go up on the Convention Stage for a “talk show” and answer some of your burning questions! The full schedule for STAR Live Talk will be released closer to the convention dates. Stay tuned! Welcome to K-POP World! It is is an interactive space where you can write and send letters to your idols on our KCON official fan letter pack, take pics in front of our massive photo walls, and even see a star appearance. If you’re really lucky, you might even get to take a selfie with the Artist! YAASS!! It’s a great place to make lasting memories of KCON, so we highly recommend stopping by if you have time. You can pre-order your KCON official fan letter pens and paper on Mwave or purchase them onsite at the KCON Merchandise booth. Your words of encouragement will brighten up your star’s day, so how could you not write a letter? One of the main events of KCON is the Red Carpet, where Artists come out and greet fans before the official MCountdown concert! Make sure you have your phones and cameras ready to take some nice snapshots like IN2IT! A few lucky fans may also have a chance for their letters (remember Star Square?) to be read on the Red Carpet! How awesome is that? You’ll need a Red Carpet pass to attend. On Saturday and Sunday of KCON weekend, we’ll be having our M COUNTDOWN concert at the Staples Center! If you haven’t purchased yours yet, you can get them here, as long as supplies last! If you’re lucky, you might be able to win a pair of tickets in the convention as well! There are some programs that run the entirety of the Convention, so we just want to note them here. Since these are areas that are active all-day, you can visit them any time that you have a spare minute or thirty. One of the best ways to get hyped for the concert is to learn some of the moves from the idols you’ll see atop our stage! Over the three days of KCON, you can learn at least one dance from each of our lineup artists–with a few exceptions. Our Fan Club Meeting Space is an area where fan clubs related to our lineup artists will host 1-2 hour programs over the 3-days of the Convention. This is an unique chance to meet fellow fans of the group (or groups) that you love, make new friends, trade photocards, and win cool prizes. Of course, if you’re not too familiar with K-Pop, you can always stop by one of the meetings and witness the fans’ passion😉 We’re fairly sure that you’ll come out of the space a brand new fan. 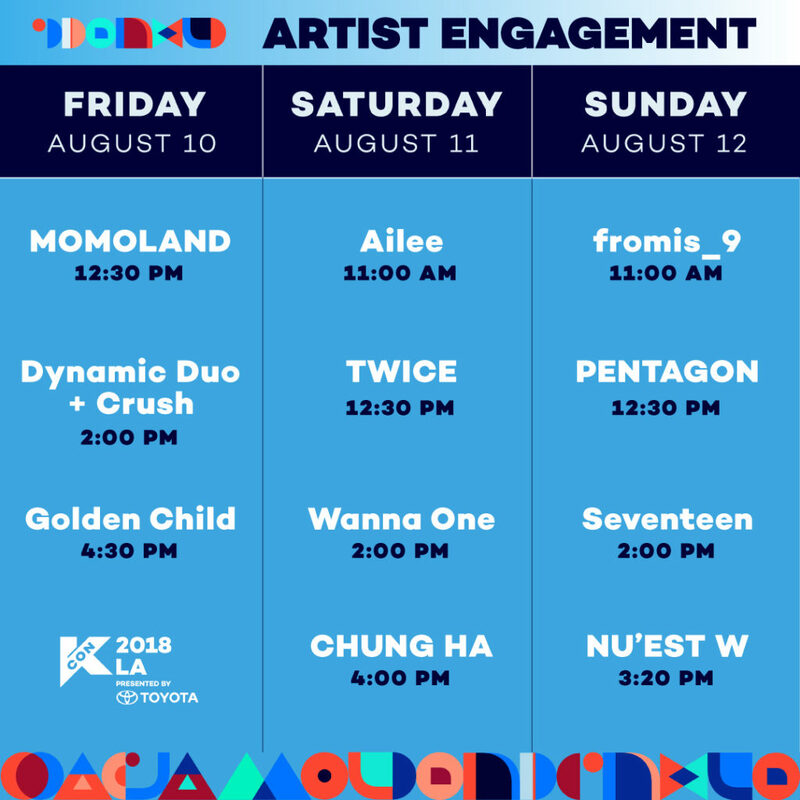 We tried to give you a look into all the content you might come across at KCON and included a few performances that will be taking place on the KCON Stage. However, there are a whole lot more performances than we have listed! You can sit back and enjoy a whole range of stages from traditional performances to hip-hop performances. Check the full list of performances on KCONUSA and make note of the performances you want to see! 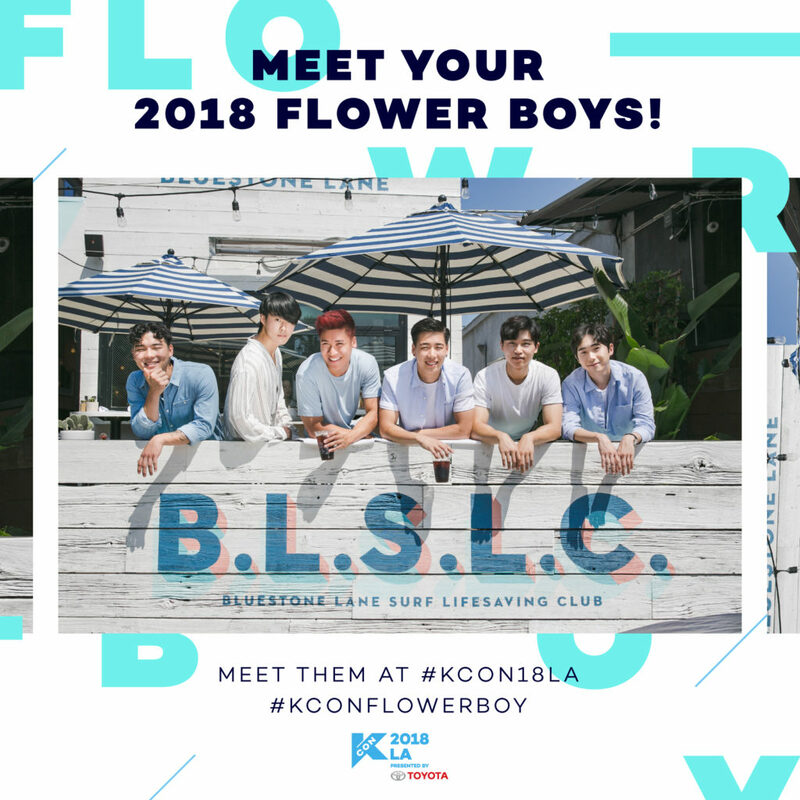 We’ll tell you in advance that Flower Boy Cafe is an add-on that you can purchase with your Convention ticket here. With the ticket, you’ll be able to stop by and chat with our very own flower boys while enjoying a (non)-caffeinated drink! You won’t want to miss out! With special guests likes model Irene Kim, you can expect that this year’s KCON Beauty Block to be LIT🔥! Stop by to try or purchase some Korean Beauty products you’ve been eyeing or win some cool prizes! Located between LA Convention Center and the Staples Center, our Food Street does NOT require a Convention ticket for entry. Any time you feel hungry or thirsty throughout the day, you can stop by our Food Street and check out the amazing meals that our vendors have prepared. Prices of each menu item will vary per vendor. Now, you’ve reached the end of our KCON 101 Guide! We’ve introduced you to all the different programs you can expect and just general information to minimize your times in lines and maximize the amount of fun! If you still need more help deciding which programs to enjoy, you can check out our #MYKCONADVENTURE series for sample itineraries!